It seems as if though very little in the world of education is without controversy as of late. Common Core, extended school days, funding, and a long list of acronyms marking a multitude of state tests at times seem to define what education is about. It is about so much more. And, while we may not always agree on every lesson that needs learned or how to teach that lesson, there is one lesson that virtually everyone agrees every student should learn – to be thankful for and to show respect to those men and women who have sacrificed so much to ensure our freedom; a freedom that is at times defined by the right to education by all. As the student body of Edon Schools joined for their Veterans Day assembly on November 11, it was apparent that the students had learned this vital lesson well. While the students showed their respects to the Veterans in attendance in a multitude of ways that included music, cards of thanks, salutes, and a donation of $345.32 from the students to the Veterans Memorial Building, it was apparent that they were not performing these acts simply because they had been instructed to. Instead, they were showing their respect out of true respect. Even the youngest of students, without doubt too young to truly comprehend the sacrifices made by the men and the women in the center of the room, or even what those sacrifices were made for, seemed to understand that those men and women were important in their lives and deserved both their attention and respect. Even the youngest of students, so focused on the flag and those men and women in the center of the room… It is a testament to the school, the parents, and the students. Freedom is not free and all throughout American history men and women have made selfless sacrifices to ensure that all of America keeps that freedom. It is an important lesson to be learned and, as schools all throughout Williams County and, indeed, the country, stopped to pause, reflect, and give thanks to those men and women, let us all stop and do the same – not just on Veterans Day but every day. To those men and women whom have served, are serving, and will serve – there is no amount of words that a reporter can write that can express our gratitude. The best we can really do is stand back and watch as the students of our schools do their best to express that for us all. © 2014 – 2016, Chelsie Firestone. All rights reserved. 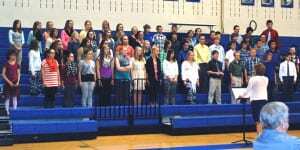 Be the first to comment on "Edon Students Honor Local Veterans During Assembly"